Successfully prepare students for the international marketplace. Provide a Thorough Understanding of Emerging Markets: Reinforce topics through numerous cases, inserts, and end-of-chapter questions and exercises. Note: You are purchasing a standalone product; MyManagementLab does not come packaged with this content. 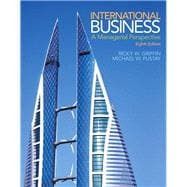 If you would like to purchase both the physical text and MyManagementLab search for ISBN-10: 0133768759/ISBN-13: 9780133768756. That package includes ISBN-10: 0133506290/ISBN-13: 9780133506297 and ISBN-10: 0133543978/ISBN-13: 9780133543971.